Once you have some experience in trading equities and other financial instruments, you may ask yourself how does option trading work. Investigating the methods used in this form of trading will help you to expand your knowledge and augment your trading skills. Some traders prefer to invest exclusively in options. The first thing that you need to understand about options is their fundamental distinction from typical financial instruments. These investments are not like other assets, such as equities or bonds. They involve the use of contracts and resemble another type of investment known as futures. As with futures, buyers who purchase options are securing contracts that involve the sale of an underlying asset between two parties at a future date for a set price. The key difference between the two is that options only purchase the right to honor the contract under the given conditions. There is no obligation involved. If things do not turn out the way that the buyer planed, he can let the option expire and only lose the premium paid for the contract. Such an action does not involve a total loss. How does option trading work? There are two kinds of options: call options and put options. Once you understand these two approaches you will have a solid understanding this trading activity. You make a call option when you believe that a stock is going to rise in value. The option gives you the right to purchase a certain amount of goods at a specific price. If the price rises as you expected upon the given date, you will still be able to buy it at the prearranged lower price before making a quick sale of profit. A put option is just the opposite. If you own an asset and believe it may lose value, you can buy a put option. This allows you to sell it at the higher price if it has decreased in value on the contract date. 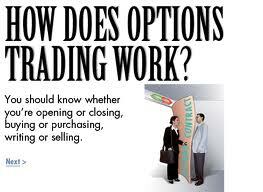 With these two tips, you can better understand how does option trading work.